Hurricanes are large, swirling storm systems with powerful winds and heavy rain. A few other names for them include tropical cyclone, typhoon, tropical storm, tropical depression- depending on the strength and location. Hurricanes are formed over warm water and naturally come cascading towards the coastline through “hurricane season”, which spans June 1 to November 30. The probability of hurricanes occurrences noticeably spike late August and into September. They are named off of a pre-determined list developed by the National Hurricane Center. If you live near a coast line, you definitely need to be thinking about your hurricane risk and preparing accordingly. Although the higher numbered category hurricanes are well known for the destruction they can cause, the lower wind speed storms can also cause a surprising amount of damage. Some of the most dangerous storms were lower category hurricanes paired with already water-logged soil. The speed at which the hurricane moves across land also factors in, since prolonged localized flooding can cause problems for months and even years. Not on a global scale. While hurricanes and typhoons can definitely devastate regions and entire small countries, they are too concentrated geographically to pose a global risk. The storms gain their power by developing and traveling over bodies of water, so this limits hurricane risk to only a few hundred miles inland from coastlines. 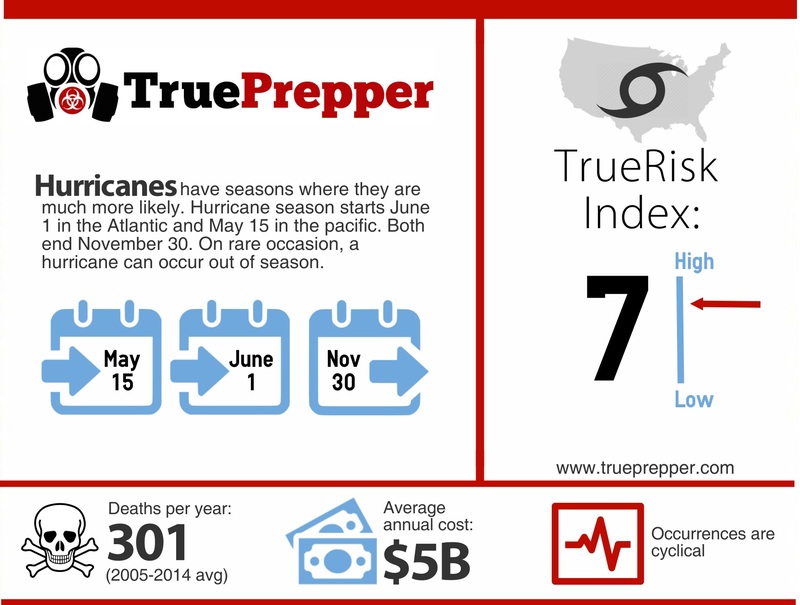 Hurricane rings in as a 7 on the TrueRisk index. This threat level is dependent on your location, for the most part. Geographically, higher altitude areas and places further from the equator are more susceptible to extremely cold weather. This also usually means that these places are more prepared for it, which makes cold weather particularly dangerous for tropical areas if they were to experience them. The balance of high impact, low probability in hotter areas and low impact, high probability in colder areas lends the idea that everyone should be prepared for cold weather events on a basic level. To determine your risk level, check out your geographic weather patterns and see if you have any redundant heating systems available. There is usually plenty of notice prior to a Hurricane. Many others respond to a Hurricane watch by running to the store and stocking up on “essentials.” Hopefully, you already have food and water storage and plan to ride out a hurricane comfortably. Make sure that your backup power solutions and water runoff are well prepared for, since you will possibly encounter flash flooding and power outages. The standard kit duo of in-place survival kit and BoB (Bug Out Bag) should cover most of the bases. The usual advance notice and tracking of hurricanes should make it easy for any prepper to be adequately prepared for the worst. If you live on the coast line, you may want to consider evacuating or bugging out- especially if local emergency management is urging you to. Otherwise, settling in and riding out the storm is the best plan. You may need to mitigate water damage as storm surge and flash floods occur. You may also need to start a generator or light candles when the power goes out. When a hurricane arrives, there is very little to do except for ride out the storm and stay informed. If anything disastrous occurs, like a tree falling on your house, you may need to mitigate the damage right away. The supplies you already have on hand and your survival kit should be a start for most damage. Keep your family safe, and towards the center of a house. If the hurricane is strong enough, tornadoes and straight line winds can do a large amount of damage. The eye of the hurricane is not a good time to go outdoors to evaluate damage- the backside of the eye is often the most powerful part of a hurricane and you do not want to be outdoors when it arrives. After the storm completely passes, do a damage assessment of your property and assets. Chronicle all damage prior to fixing it with photographs and notes, especially for insurance companies. If you cannot get your home habitable quickly, you may need to make arrangements to stay elsewhere until disaster recovery can assist you. There are many ‘carpetbaggers’ that come around offering to remove trees at very inflated prices- report any of these incidents to the authorities if possible. The practice of price gouging victims of disasters is not just sleazy; it is illegal in some states.